Bateman was best known as a cartoonist for Punch, back in that poor old magazine’s glory days. His singular style and sense of humour made his efforts as instantly recognisable then as Larsen’s are today, possibly more so. 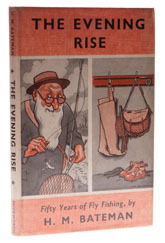 His output was positively phenomenal, so I was fascinated to discover that he had a life long interest in fly fishing – with this one little book to prove it. The Evening Rise is more or less what one might expect from the pen of a cartoonist; the chapters being short and pithy, the majority concentrating on a single incident, the rest stringing anecdotes together to illustrate a theme. One of the most interesting things about the book, apart from the opportunity to appreciate Bateman’s talent, is the sheer variety of his subjects. My favourite is the chapter on fishing in LA, where he was taken to fish on the Azusa and Redlands Rainbow Angling Club water – accessed through a café. The café had racks of ready assembled rods along the walls and one side opened to reveal an indoor artificial lake full of stocked fish. By contrast, there is another tale about the Welsh Harp, a reservoir near Hendon, which is the backdrop to a description of a strike to end all strikes, with a cartoon to prove it. Well worth picking up, if you can find a copy.